Bigg Boss Tamil Voice: Big Boss Season 2 Tamil is the ongoing current season of the reality TV show airing on Star Vijay from 9:00 to 10:30 pm on weekdays and 9:00 to 11:00 pm on weekends. The show is moving at a fast pace in all three languages Hindi, Tamil, and Telugu. Big Boss Tamil is hosted by Kamal Hassan. The season 2 commenced on 17 June 2018 and will be for 105 days this time. Everyone, in addition to guessing who the winner of Bigg Boss could be, is also curious to know about the man behind Bigg Boss’s voice. Earlier, It was rumored that the person providing the voice is Gopi Nair’s, the voice of Vijay TV. Most of the people believed that he is the real one. However, Gopi Nair received many texts and calls from his close circle asking if he is the real voice behind Bigg Boss 2 Tamil. As it is the false news he came up with the video in which he clarified that he is not the behind the Big Boss Tamil Voice. So It has been clarified by him that he, not the person. Then who is the real Big Boss? Are you searching for the Big Boss Tamil Voice? Then you are on the right page. After the confirmation by Gopi Nair, few started saying that the technology is used to change the voice to a bold and lucrative note. Many viewers firmly confirmed that it is “Kalakapovathu Yaaru, Maanaada Mayilaada” fame GOKUL NATH. But, they are not the voice providers of Bigg Boss Tamil. However, these are all just rumors. 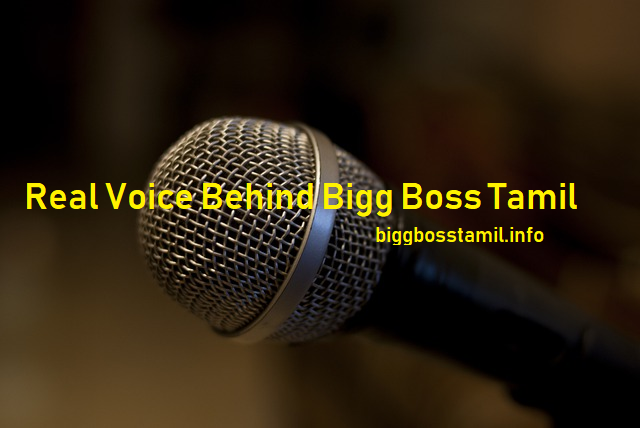 According to the sources of Tamil Big Boss show, the actual voice behind the Big Boss Tamil show is NAVIN HOLADRE who is the famous voice-over artist. It must be a great relief to a lot of viewers now, that they know the name of the voice-over artist. In Big Boss show celebrities live in an isolated house cut off from the rest of the world. They are put with challenging tasks to avoid elimination and win the grand prize. A lavish house set which was used in the first season has been renovated just prior to the commencement of the programme on the outskirts of the Chennai city in the EVP Film City at Chembarambakkam with special features, including a jail room to increase the level of punishments to the contestants who commit mistakes. Stay tuned to the site to get recent updates of Bigg Boss Tamil season 2 in no time. Share the list of these contestants to the Bigg boss fans out there.